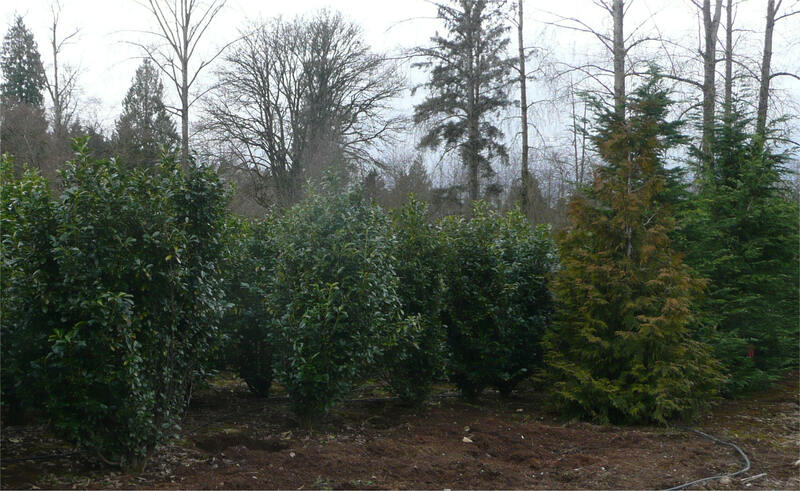 Laurel hedges are popular because they are dense and can be shaped beautifully. 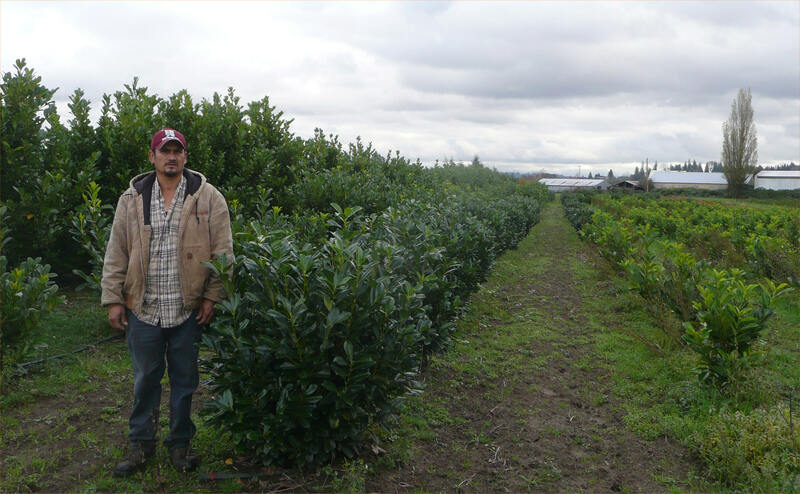 We offer several varieties of laurel, each with somewhat different characteristics. Please click on a name below, or simply scroll down this page. HeavyShipka Laurel at our river growing fields (left). 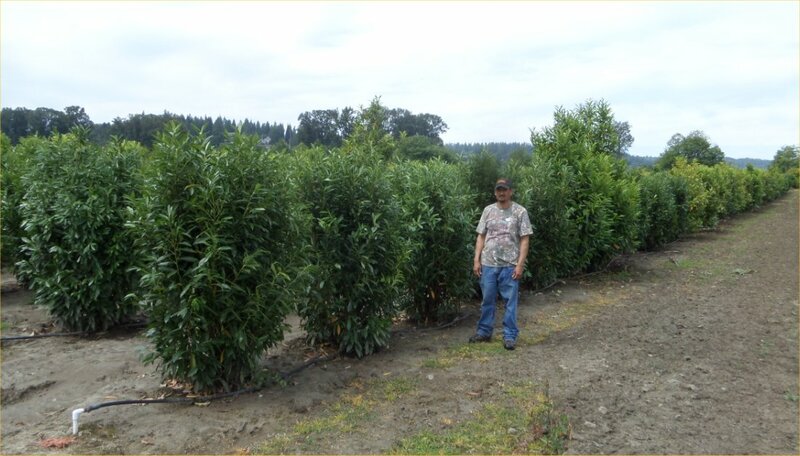 4-5' Schipka Laurel at our farm (right). Beautiful trees. Schipka Laurel has a refined appearance with dense, glossy foliage displayed with a layered effect. Its growth habit is more columnar than English Laurel and is also smaller and slower growing, which can be good. Like the other varieties of Laurel we grow, Schipka Laurel produces fragrant white flowers in early summer followed by black fruits. Cold hardy. Mature Width: To 6-8 ft.
Sunlight: Full sun, partial sun. "Instant Privacy" Use: Schipka Laurel makes a very attractive and elegant hedge, and may be sheared to 6’ tall and 4’ wide. "Instant Privacy" Spacing: These shrubs can be spaced on 4 or 5' centers (meaning the trunks of each tree are 4' or 5' apart) or wider. What to Expect the First Year: As with all newly-planted trees, these need to be watered carefully through the first Spring/Summer--see our "Care of Your Trees" section for more details. Not as much growth the first year because the tree is putting its efforts into its root system. Comments: Laurels often react negatively to being moved, although Schipka Laurels usually react less than English Laurels. These might drop some leaves, perhaps turn a little off-color, and generally not look as good as they will once they are established. Please note that our supply of trees is constantly changing; please contact us to confirm availability. "Hedged" Schipka Laurel at our farmhouse. While many people simply let their Schipka Laurel grow naturally, Schipka Laurel can be "hedged". 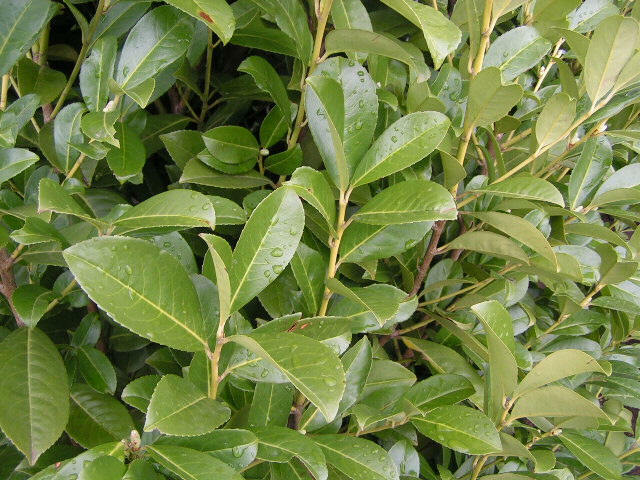 Schipka Laurel hedges can be kept to a desired height and width by pruning each year (see "Mature Height" and "Mature Width" notes below). To help people achieve a hedge as fast as possible, each year we prune the sides of some of the Schipka Laurel we are growing. These are our "Hedged" Schipka Laurel. You can see this in the photo above. Note: When "hedging" trees it is important to start pruning when the trees are small. Stated another way, if you wait to hedge the trees until they are larger, when you trim the trees you will see too much of the brown interior and main branches. 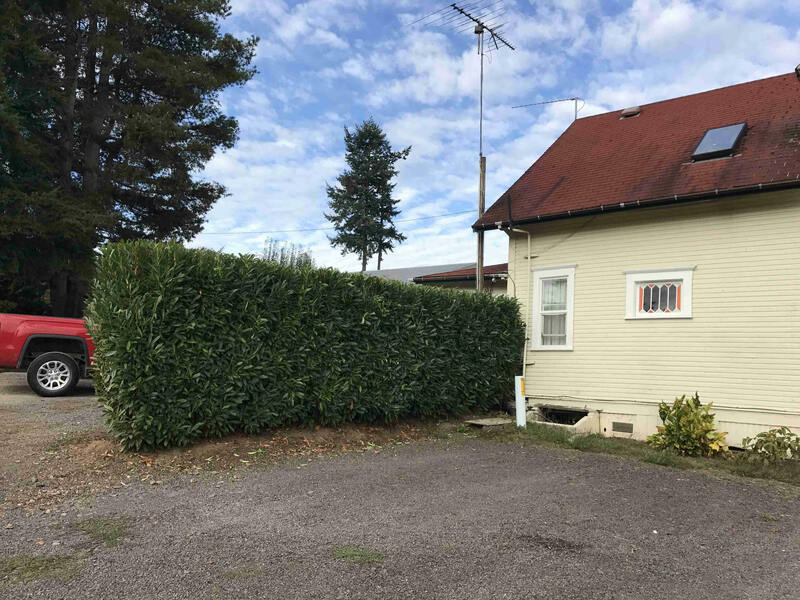 So if you want a tall hedge your choices are to start with smaller trees and prune them into a hedge as they grow, or use these "pre-hedged" trees which get you a tall hedge much quicker. No matter which way you go you will need to prune the trees each year after they are planted (see pruning notes below). Foliage: Evergreen, with some discoloring of the leaves in winter. Mature Height: Hedged to desired height; 8' or taller. Mature Width: Hedged to desired width; 4' minimum, wider is better. See other "Attributes" --Soil, Sunlight, What to Expect the First Year, etc. --in main section above. Pruning: Will need to be pruned each year--one or two main prunings and possibly one or two clean-up prunings, depending on how much of a "finished" look you want. 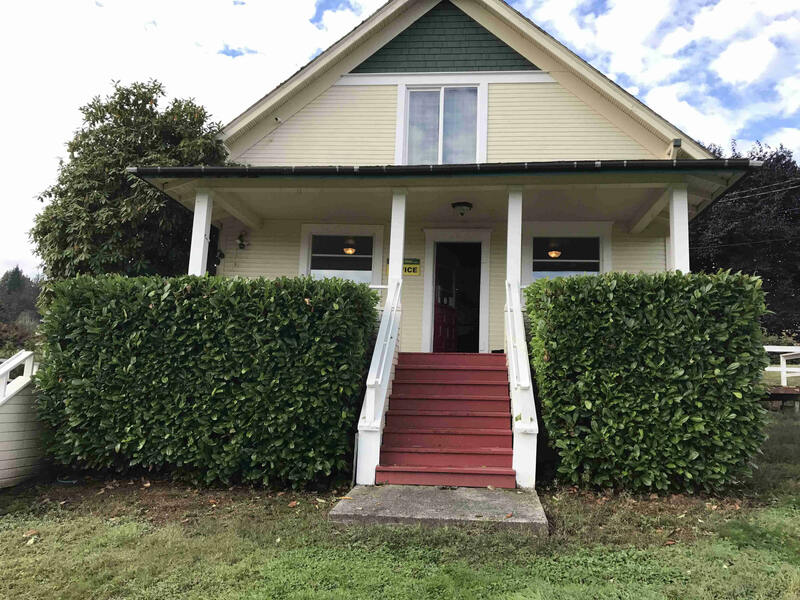 Sizes & Prices for "Hedged" Schipka Laurel are above (scroll up). Sorry, we do not have any English Laurel available at this time. English laurel an evergreen shrub/tree that is dense enough to make an excellent screen. It has shiny green leaves and can be shaped beautifully. Left unchecked it can grow up to 20' tall so it is almost always pruned on both the sides and the top. Pruning is a major issue with English laurel because it can grow so aggressively--once established it can grow up to 3' per year. But it is beautiful. 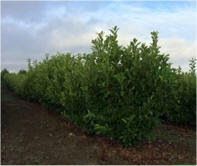 Note that we also sell a "pre-pruned" English Laurel (see "Hedged" English Laurel section below). Sunlight: Full sun, partial sun, shade. Soil:. Acid soil; don't like wet soil. Growth Rate: Fast, up to 3' a year both height and width after established, depending on growing conditions. "Instant Privacy" Use: Fast-growing, larger barrier. "Instant Privacy" Spacing: The rule of thumb is "4-5' centers", meaning the trunks of each tree are 4 or 5' apart. 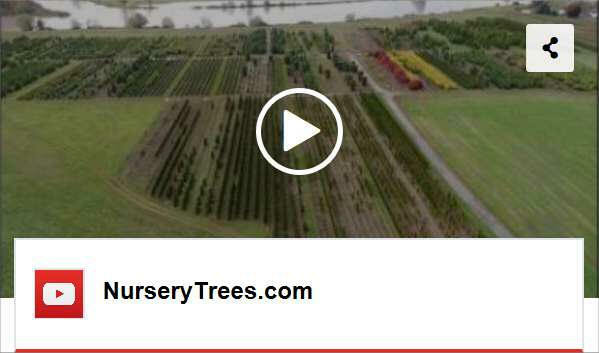 These trees are so fast-growing they can be planted wider apart than 4-5' if you're willing to wait..
What to Expect the First Year: As with all newly-planted trees, these need to be watered carefully through the first Spring/Summer--see our "Care of Your Trees" section for more details. Not as much growth the first year because the tree is putting its efforts into its root system. 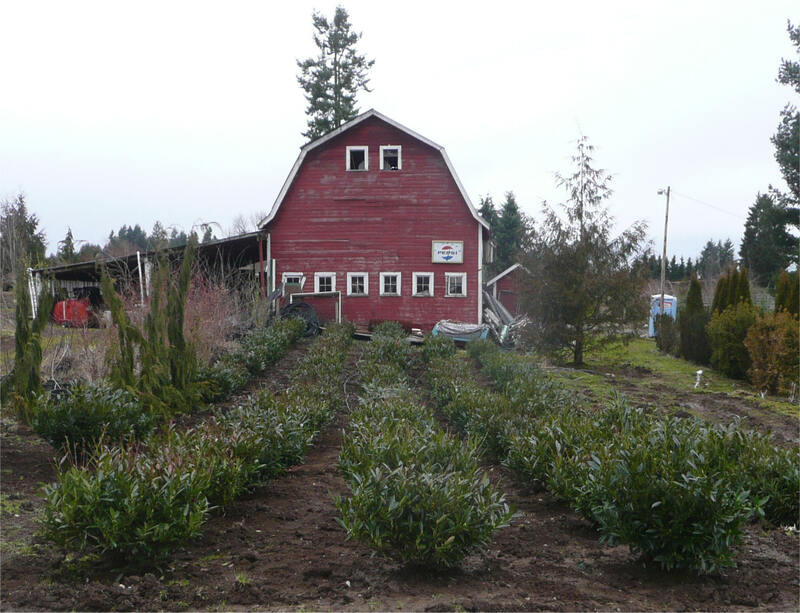 Also, laurels often react negatively to being moved—the first year after planting they will drop leaves, often turn yellow/green, and generally don’t look so great. But these are tough trees and over time they come back and look fine. We will typically ask you to "stay the course" during their first growing season/first winter; and as long as they put out new growth their first spring in the new location they will be fine and gradually recover to look right. This is "part of the deal" with Laurels. Comments: Somewhat wild look if not pruned. All English Laurels are "balled & burlapped", and are nice full, bushy trees. Limited Quantities of some sizes. While many people simply let their English Laurel grow naturally, usually English Laurel is "hedged". English Laurel hedges can be kept to a desired height and width by pruning each year (see "Mature Height" and "Mature Width" notes below). To help people achieve a hedge as fast as possible, each year we prune the sides of some of the English Laurel we are growing. These are our "Hedged" English Laurel. You can see this in the photo above. 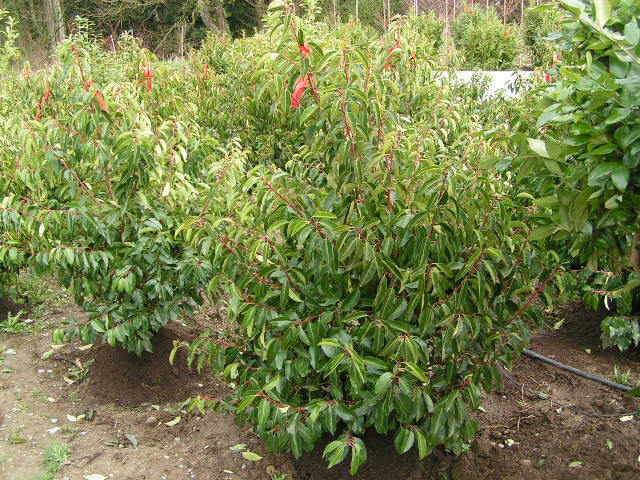 Sizes & Prices for "Hedged" English Laurel are above (scroll up). "Before" & "After English Laurel Planting. This screening will only improve over time. Native to Spain and Portugal, Portugal Laurel is an easy to grow, densely branched shrub, with glossy green leaves that are reddish when young. Fragrant white flowers are produced in early summer and followed by red fruits, which turn black in the fall. Portugal Laurel may be trained as a very ornamental single or multi-trunked tree. 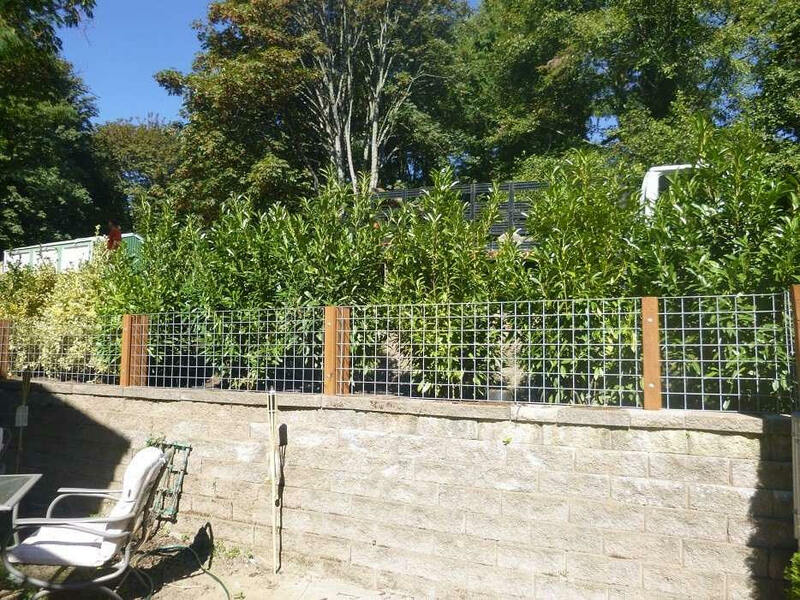 Mature Height: To 15-18 ft.
"Instant Privacy" Use: Portugal Laurel makes a beautiful hedge. It’s especially attractive in the spring with its reddish new growth and reddish branches. It may be sheared to 6’ tall and 4-5’ wide. "Instant Privacy" Spacing: These shrubs can be spaced on 3, 4, or 5' centers (meaning the trunks of each tree are 3', 4', or 5' apart) or wider. What to Expect the First Year: As with all newly-planted trees, these need to be watered carefully through the first Spring/Summer--see our "Care of Your Trees" section for more details. Not as much growth the first year because the tree is putting its efforts into its root system. Also, laurels often react negatively to being moved, although Portugal Laurels usually react much less than English Laurels. These might drop some leaves and generally not look as good as they will once they are established. Comments: Tolerant of heat and drought once established. Will not tolerate poor drainage. 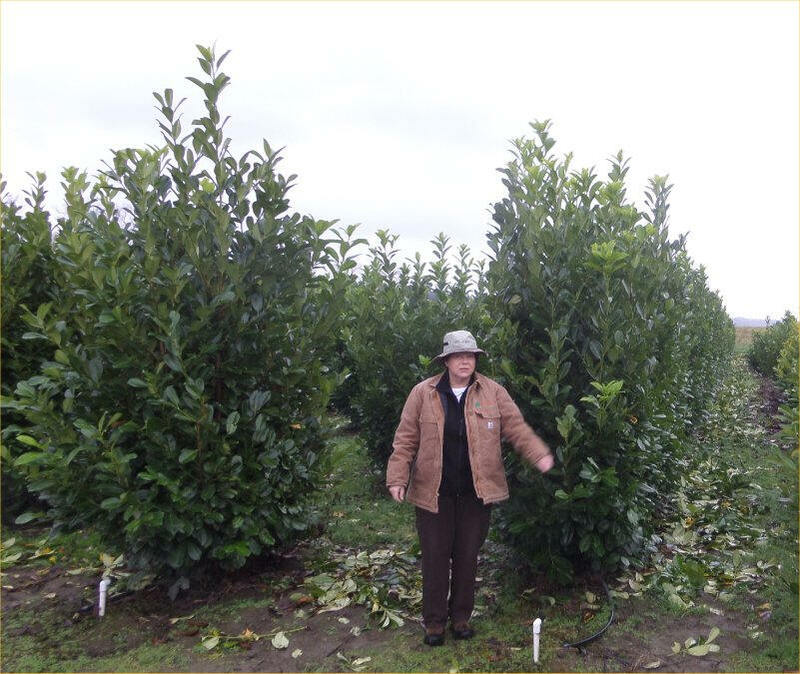 Dwarf-Leaf English Laurel growing at our river fields (left) and larger plants at our nursery (right). Dwarf-Leaf English laurel has many of the same attributes of the "regular" English Laurel. The one major difference is the size of the leaves--the Dwarf-Leaf Laurel has a significantly smaller leaf. We have also found that these trees are more dense and are less susceptible to dropping leaves. The "literature" will say that these trees don't get as big as the regular English Laurel, but our experience is that they are very close--there are trees in the field over 20', for instance. 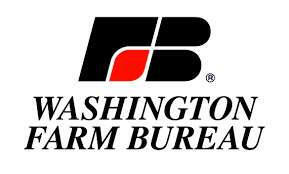 Growth Rate: Moderate-fast, up to 3' a year both height and width after established, depending on growing conditions. Not as fast as the "regular" English Laurel (above). "Instant Privacy" Spacing: The rule of thumb is "4-5' centers", meaning the trunks of each tree are 4 or 5' apart. So if you're trying to cover 20' and want them 4' apart, you'd need 6 trees (the first one at "0" ft. on one end, and then one every 4' after that). These trees are so fast-growing they can be planted wider apart than 4-5' if you're willing to wait. What to Expect the First Year: As with all newly-planted trees, these need to be watered carefully through the first Spring/Summer--see our "Care of Your Trees" section for more details. Not as much growth the first year because the tree is putting its efforts into its root system. Also, laurels often react negatively to being moved—the first year after planting they will drop leaves, often turn yellow/green, and generally don’t look so great. But these are tough trees and over time they come back and look fine. Check with us for smaller sizes. Otto Luyken Laurel at our nursery. These plants are "balled & burlapped". 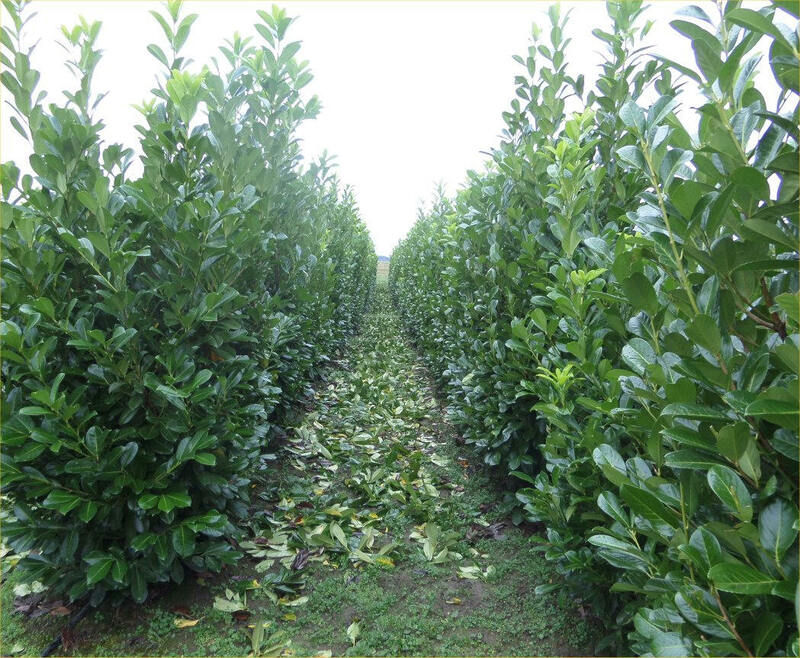 Otto Luyken Laurel is a low growing variety of English Laurel, with a lush, dense, spreading growth habit. 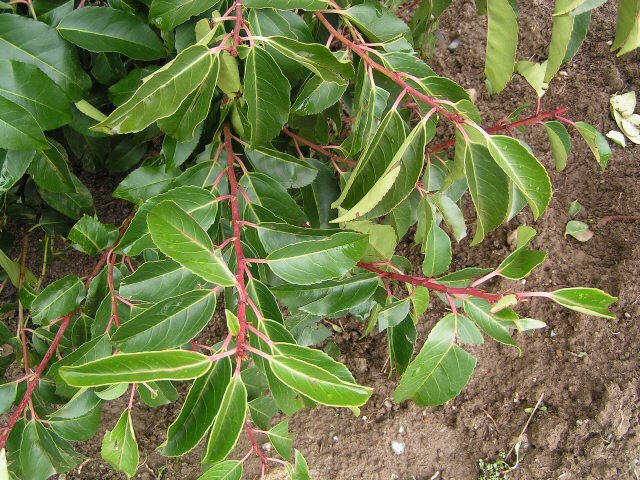 Its narrow foliage is a dark and glossy green. Very adaptable, it tolerates deeper shade than English Laurel. Otto Luyken Laurel is very drought tolerant once established. 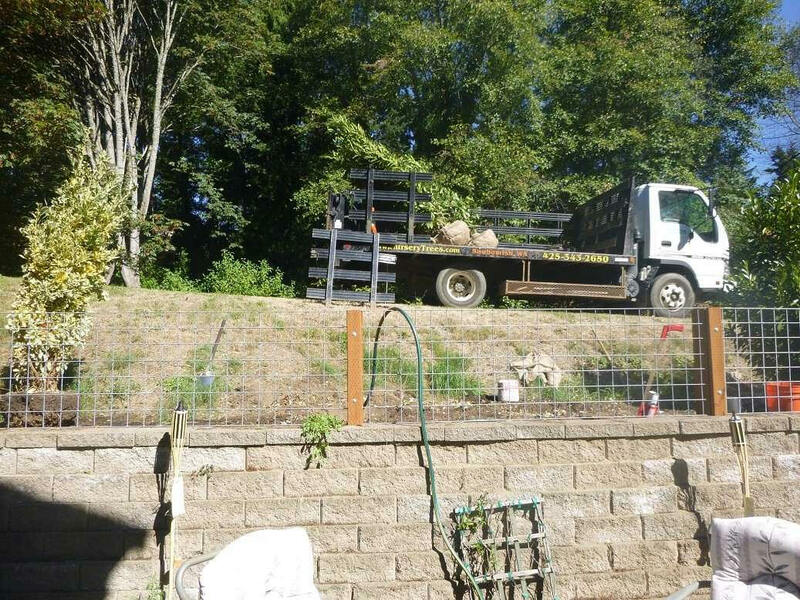 We deliver and plant trees throughout Washington: Seattle, the "East Side", Bellingham, Vancouver (WA), east-of-the-mountains, etc. 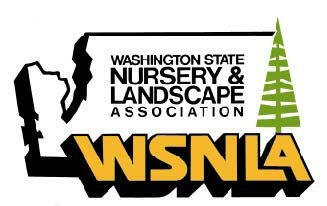 Contact us for free estimates: info@NurseryTrees.com (425) 343-2650. Sunlight: Full sun, partial sun, shade tolerant. Spacing: Can be used as a low foot traffic barrier, hedge or low screen. These shrubs can be spaced on 2, 3, or 4' centers (meaning the trunks of each tree are 2', 3', or 4' apart) or wider. Comments: An adaptable, low-maintenance background shrub or low hedge. Looks great as a low hedge in front of our Emerald Green Arborvitae.